Federal Hall is one of the most distinguished places in American history. In buildings on this site freedom of the press was established, America's first Congress was held, the federal government was established, Washington was inaugurated as president and the Bill of Rights was ratified. John Peter Zenger, a newspaper publisher, was tried in 1735 in the original building on this site for libel against the royal governor. His acquital established the principle that truth was a defense in libel cases. The court decision was enshrined in the Bill of Rights, adopted on this same site 54 years later. When Britain began to tax the colonies, Americans were not united. They lived in 13 separate colonies with little communication up and down the Atlantic Coast. When the Stamp Act drew outrage, the patriots held a Congress in New York. 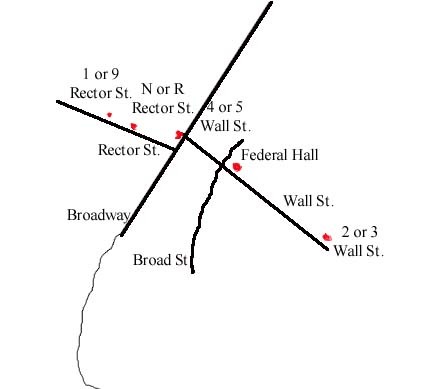 The delegates from nine colonies met at City Hall, as Federal Hall was then called, on Oct. 7, 1765. They drew up an address to King George III, the House of Lords, and the House of Commons, saying they were entitled to the same "inherent rights and liberties" as people in Britain. After American troops evacuated the city, the building was used as British headquarters for much of the war. When the war was over, Washington took possession of the city, the last outpost of Britain in the colonies, in a ceremony on the steps of the building. The loose system of government established under the Articles of Confederation after the war did not work and Americans soon realized they needed a stronger government. 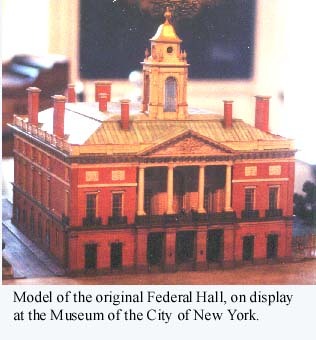 Congress met in Federal Hall on March 4, 1789, to establish the new federal government under the Constitution. Their first act was to count the ballots naming Washington as the first president. Washington was inaugurated on the steps of the building on April 30. While the new Constitution established government by the people, many feared it did not do enough to protect individual liberty. 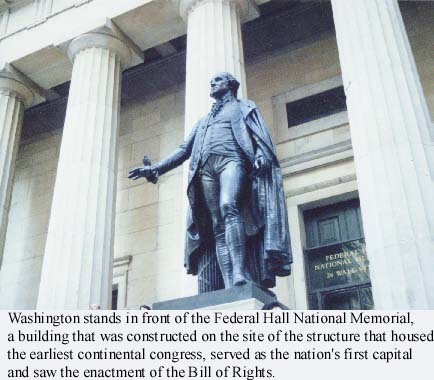 Congress adopted the Bill of Rights in Federal Hall on Sept. 25, 1789. This permanently established the freedoms that the Stamp Act Congress had requested from the same spot 24 years earlier. Hours: Monday-Friday, 9 a.m. -5 p.m.; Closed National Holidays. Open weekends and holidays in July and August.